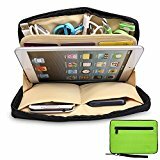 Elastic loops to hold various items like cables, memory cards, pens and etc;Enough interior pockets keep your hard drive, adapters,cell phone, card, cash, passport, etc; And more, this organizer bag can hold your iPad Mini even iPad air with smart cover and tablet. It is Universal !!! Keep your electronics accessories organised and easy to find with this Universal Electronics Accessories Travel Bag from Damai Organise your electronics accessories and card and tablet the easy way. This Universal Electronics Accessories Travel Organizer provides a excellent organisation solution for your electronics and computer accessories. It helps make you better organized with all the small travel items and tablet . Measuring 10*8.2*1 inch it is large enough to hold most of your accessories like 2.5″ external hard drive, cables, adapters, chargers, memory cards, batteries, pen, cards, passport phones, iPad Mini , ipad air , and tablet, or almost anything else you might need with you. This Bag features many elastic loops and internal mesh pocket and cell pockets, etc. It provides excellent flexibility to allow you maximising its storage space. It can also serve as a travel checklist. Before you leave a place, just open the case and check if everything is there, preventing you from leaving things behind. Multiple pockets to classify your personal stuff, also can be used as Travel Makeup bag with your cosmetics.